Originally published by John Dell from the Winston-Salem Journal on 8/21/15 here. The best thing about riding in the MetLife Blimp over Winston-Salem was there weren’t any signs of drones. That made for clear flying and a nice trip Thursday morning, despite plenty of cloud cover. One of the pilots, Terry Dillard, said he’s heard of drones being a problem from time to time but he’s never encountered any issues. As for his job of riding around the East Coast from sporting event to sporting event in a blimp, he has a good time with it. Wyndham Championship going on in Greensboro at Sedgefield Country Club. The blimp’s parking spot has been at Smith Reynolds Airport, and according to pilot Alex Orcutt, officials at Smith Reynolds have been friendly and coorporative. “We like to use our home base at smaller airports, and this just makes sense,” Orcutt said as he flew over Winston-Salem about a half-mile up below the cloud cover. Last year, the blimp was parked at the Burlington-Alamance Regional Airport for the Wyndham Championship. 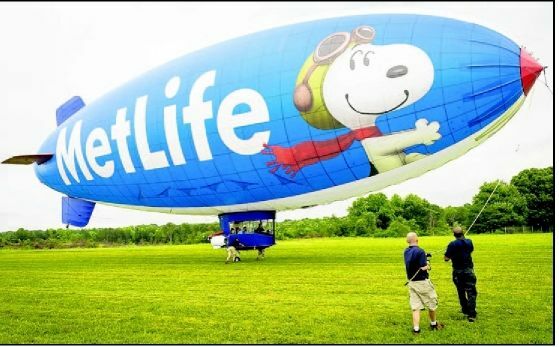 Dillard said that there are three MetLife blimps, two in the United States and one in Japan. The blimp that is here this week is Snoopy One, and it will be used for all of the aerial coverage for the Golf Channel and CBS. 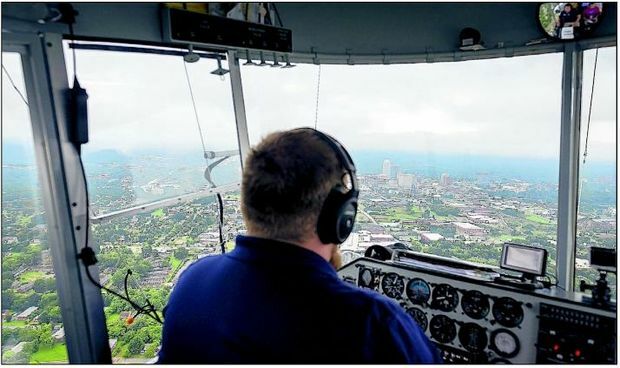 The crews that work the blimp travel from city to city between sporting events and mostly handle golf coverage in the summer. After the Wyndham Championship, Snoopy One will be heading to Boston for the second FedEx Cup playoff tournament in two weeks at the Deutsche Bank Championship. Dillard has been flying blimps for 25 years and has been to several Super Bowls, World Series and countless major golf tournaments. He says they all run together, but where he gets the most satisfaction is when he works with the Make-A-Wish Foundation or the Believe in Tomorrow organization. 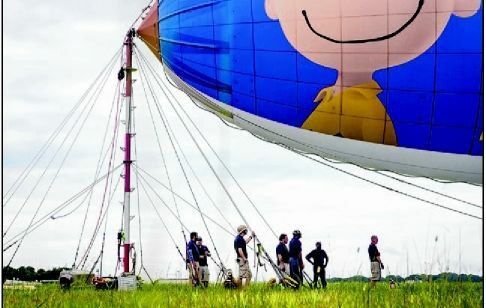 They work with children’s hospitals to provide blimp rides. When the crew of about 12 is not working with the blimp, they spend a lot of time around Winston-Salem eating at various restaurants. When Dillard is wearing his crewshirt, folks frequently ask him what he does. Because Smith Reynolds is not a big airport, Dillard says some folks have come up to the chain-link fence close to where the blimp is parked and have held up $100 bills. “They have called out to us and want to know if they can go up,” Dillard said. The blimp will spend a lot of time at Sedgefield Country Club going back and forth until Sunday. The blimp measures 132-feet wide and the gondola underneath can hold five people. There’s no air conditioning and no bathroom. “You have to plan accordingly,” Orcutt said. One of the luxuries of the blimp is it travels between 30 mph and 70 mph, allowing the TV cameras that are mounted to it to give viewers at home great shots. And it’s also nice for still photographers. A good cruising speed to get optimum photos is about 35 mph, according to Orcutt. The blimp, which stays inflated thanks to helium, has two engines that provide the thrust to go forward. The engines run on gas, and Dillard said the blimp gets pretty good mileage. Before Thursday’s afternoon telecast of the first round at the Wyndham, the crew mounted a gyrostabilized camera on the tip of the gondola to provide 80 times magnification for close-up shots. Because the blimp sits up high enough, golfers can’t here the engines. Dillard said as far as he knows, the only place to buy a ride in a blimp is in Europe.